Unfortunately, client printing in Terminal Server 2003 can be very frustrating. However, it almost always boils down to issues with drivers. Lots of drivers are simply not compatible with Terminal Services. Stick with Windows native drivers whenever possible and keep the number of drivers low. Using third party drivers is usually trouble. Although you should add native drivers if necessary, try to limit the amount of drivers. This can be done by using the same driver for several printer types. HP has a universal printer driver available, which supports almost all their printers. It is a good way to limit the amount of drivers, but please note that on some printers, some options are not supported. Download and install HP's Universal Print Driver. Download the latest HP Universal Print Driver from here. Go to Start --> Printers and Faxes. Go to File--> Server Properties -> Drivers tab and choose Add Driver. Windows Server 2003 SP1 and newer versions of Windows Server include the “Terminal Server Fallback Printer Driver”, which can be enabled via group policy at Computer Configuration -> Administrative Templates -> Windows Components -> Terminal Services -> Client/Server Data Redirection. The Terminal Services Fallback Printer Driver allows for the system to connect printers without installing additional Server Side Printer Drivers. The Policy can be set to auto-create unsupported printers using a Fallback PCL or Fallback PS Drivers. The fallback drivers provide only basic functionality and will not work with all printers. Both settings of "Not Configured" or "Enabled" with "Do nothing if one is not found" will result in no client printer being created using the fallback driver. 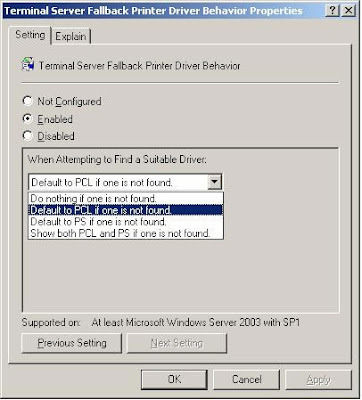 "Default to PCL if one is not found" will result in an auto created printer using the PCL driver if the standard driver mapping process cannot find a suitable driver on the Terminal Server or in a mapping file. "Default to PS if one is not found" will result in an auto created printer using the Postscript driver is a suitable driver cannot be found. "Show both PCL and PS if one is not found" will result in an auto-created printer using the PCL and the PS driver. 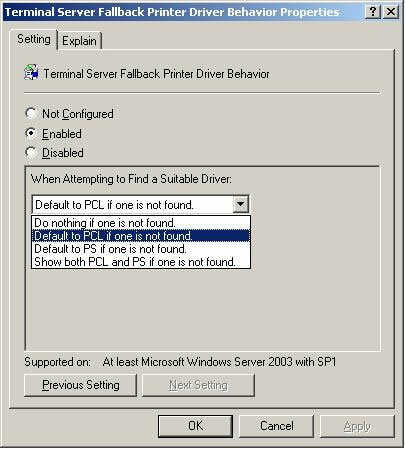 Microsoft provides a mechanism to set the driver that is used for the Terminal Server Fallback PCL and PS Printers. To alter the default behavior, alter the following registry key and enter the desired printer driver. "FallbackPclDriver"="HP Universal Printing PCL 5"
Reboot your server and should be able to print from any HP printer. Your post is very useful can you please help me with the driver download link, the patch related to printer installation is missing in my system. Nice Blog & Really its very useful information that you have shared and thanks for sharing the information . It's the great update on terminal server 2003 print. Surprising journal hp deskjet 2655 manual Thank you for sharing. Substantial articles 123.hp.com/setup Thanks for sharing useful information.